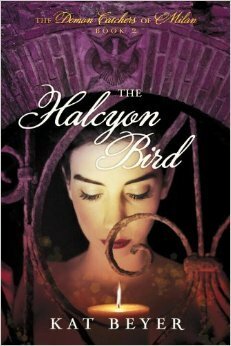 Posted on March 18, 2015	by Katy K.
I was lucky enough to win The Halcyon Bird from Charlotte at Charlotte’s Library (in a rare-for-her YA book giveaway), which naturally meant that I had to go back and read the first one from my library’s copy. 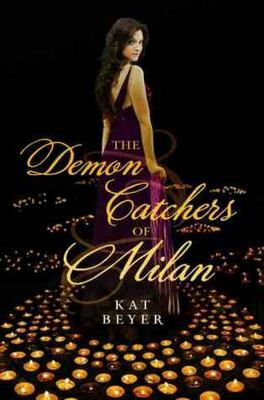 The Demon Catchers of Milan by Kat Beyer. Egmont USA, 2012. American teen Mia is unexpectedly possessed by a demon, involving terrifying yet seductive out-of-body experiences and freakish displays of strength, cruelty and mind-reading. The Church says they won’t help a Della Torre – so previously unknown relatives fly out from Italy to help with the exorcism. These include the grandfatherly Giuliano and handsome cousin Emilio – on whom Mia would be crushing were it not for the super-embarrassing way they met, with her in a puddle of her own urine due to the possession. But the possession has left her vulnerable, so she’s flown out to her family’s magical candle shop in Milan, where she starts to learn the family demon hunting trade. This involves a crash course in Italian, lots of history, and meditations on the Virgin – despite the family’s uneasy relationship with the church. Tension builds as Mia grows increasingly bored with staying inside, but feels the demon waiting for her whenever she ventures outside. There are unquiet ghosts and lots of noisy and food-loving relatives. My short take on this is that it’s Buffy meets Farmer Boy with a hefty dose of Italian food love and close-knit but sparring family members taking the place of the Scooby gang. There are a lot of well-drawn characters with varying opinions on the family business and the best course for Mia to take, including two women who’ve made themselves part of the historically male side of things, one a model and one a lawyer with a Rwandan fiancé. And while Mia is thrown into a strange situation – she hadn’t known about her family’s historic business previously – she also sees quickly that she can’t just sit around doing as she’s told and waiting for things to happen. There is a hint of romance, even as Mia knows it’s inappropriate. The Halcyon Bird by Kat Beyer. Egmont USA, 2014. In this sequel, Mia has gained a lot of self-confidence and her own demon-catching kit. She’s a full member of the team doing lots of research to help them defeat a “demon of place” that’s threatening a client. As this project involves building a door to the spiritual side of the house, Mia also meets a handsome and single young carpenter, Bernardo. Romance ensues, though happily not the exclusion of other plot elements or thoughts in her head, despite the romantic cover. And always, though she’s learned better how to defend herself from it, she’s on the lookout for the demon which first possessed her in America and is still trying to get through to her. The demons are terrifying, and no one around her is safe (cue ominous music)… but this is a highly satisfactory book. The only sad note to this is that just as I was finishing it, word came out that Egmont, the publishing house is closing, so I’m keeping my fingers crossed that the third book in this series will be published! Pair this with Buffy, of course, and perhaps also with Robin McKinley’s contemporary teen fantasy Shadows. This entry was posted in Books and tagged demons, teen fantasy. Bookmark the permalink. I’m glad you enjoyed these! I had to laugh at the Farmer Boy comparison, but yes indeed, the food element is certainly strong in both! I am hoping hard for a third book….